Alexander is a collectible bear. He has multi-tone fur, grey and white plush, with hints of light brown. He has light grey velvety ears and pads with charcoal stitching. His grey muzzle is flecked with white freckles. 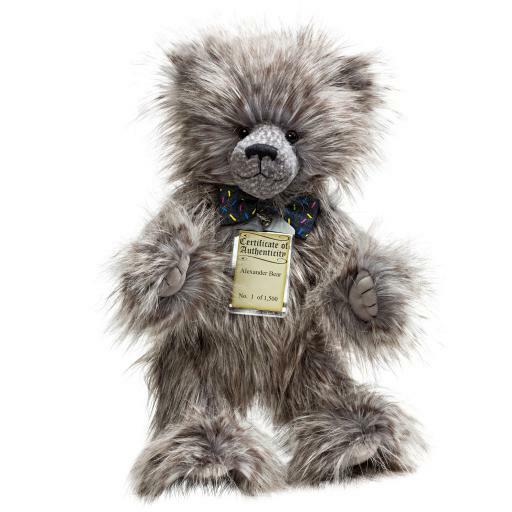 He's sporting a smart denim bow tie, with multi-coloured dashes.As with all the Silver Tag bears, Alexander is fully jointed, substantially weighted, and has a classic hump. Alexander comes with an individually numbered Certificate of Authenticity. He is 54 cm standing. Alexander is one of 1500. He can be spot cleaned.